You may know the feeling. You arrive for an appointment with your dentist, and after he or she says hello, you wait sheepishly for the question you know is coming: “So, have you been flossing regularly?” If the answer is no, you respond apologetically with a tinge of shame. But you are certainly not alone in that regard. In terms of oral hygiene, flossing is one of the hardest habits to adopt, especially if it isn’t something you’ve been doing from an early age. There are many reasons why people hate flossing, but resistance to regular flossing should crumble when the consequences are considered. If you don’t floss, food debris and oral bacteria can build in the crevices and cracks between your teeth and gums leading to infection. Bleeding, infected, and inflamed gums, periodontal disease, and even more serious health issues linked to such problems, such as heart disease, diabetes, and respiratory infections, can all be the byproduct of keeping your dental floss tucked away and gathering dust in the corner of your medicine cabinet. Flossing regularly is a cornerstone of good dental hygiene, but what is “regularly”? How often should you be flossing and what is the most effective way to do so? You should floss at least once daily. It doesn’t particularly matter when you do it during the course of the day or whether it is before or after you brush your teeth just as long as you do it. 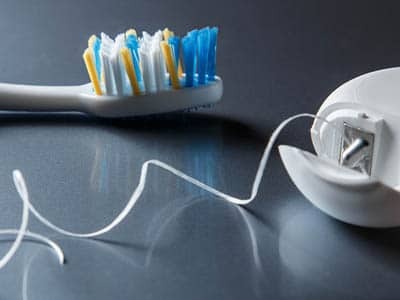 Flossing earlier in the day reduces the chances that you’ll forget about doing it later, while flossing before bedtime or even during the middle of the day may fit better into your lifestyle. Whatever works for you will work for your teeth and gums. To effectively floss between your teeth and do the best job of removing food and bacteria, take a piece of oral dental floss that is about 12-14 inches in length. Wrap each side around the index finger of the right and left hands, and hold the floss in place with the thumbs. Next, gently slide the floss down the vertical face of one tooth, across the gap, and up the vertical face of the proceeding tooth. This is to be done between each tooth, removing stray food particles that brushing may have missed. Good dental habits can play a huge role in the health of your teeth and gums, as well as improve your overall health and well-being. At Assure A Smile in Miami, we partner with our patients to help them develop healthy, natural, and effective oral hygiene habits as part of an overall wellness strategy and holistic healthcare approach. To learn more about the importance of holistic dentistry and how to develop healthier habits for a better you, please contact us today at 305-274-0047.